– BeNow TV: It’s a mighty essay film; a tremendous, hypnotic collage that doesn’t seek out what’s concrete and tangible, but instead aims to penetrate the poetry of Theodorakis’ oeuvre … It is like a notebook, filled by Kutulas with images, thoughts, associations and visions of Theodorakis and his music. The result feels like a cinematic river, frequently turning into a roaring torrent. The movie oscillates between energy and meditation; it possesses a great sense of form, lives off its bold contrasts and juxtapositions, comes with lavish orchestration and almost operatic accents – it is told like a piece of music. – Süddeutsche Zeitung: “Dance Fight Love Die“ splices music and moving images into a condensed representation of the life and work of an enfant terrible of recent European musical history: Greek composer Mikis Theodorakis. – programmkino.de: Kutulas projects a challenging blend of historic document, artful essay and fast-paced onslaught of imagery. – der Freitag: Theodorakis is always in motion; he connects continents with his appearances. More than once, his larger-than-life persona shines through. – junge welt: Kutulas loves ballet, turning this life-in-film into a ballet of many acts. It is more of a dance than a journey through time, as the title itself suggests … Kutulas’ film is far more than a biopic. Through the composer’s music, it tells the history of Greece. Using the life of this musical and physical giant, he describes what it means to be Greek. – nachrichten.net: Without any flattery, bells or whistles, Kutulas sends viewers on a voyage of discovery, exploring the universe of a great Greek, Mikis Theodorakis. Employing quickly changing scenes and a completely dialogue-free plot, Kutulas effortlessly bridges the gap between space and time, reality and dream, all overshadowed by Theodorakis’ incredible music … Kutulas’ work is a true cinematic highlight! – filmjournalisten.de: Like a volcanic eruption, Asteris Kutulas – who also wrote the script together with Ina Kutulas – hurls 30 years of Mikis Theodorakis’ efforts and works onto the silver screen … Like fireworks, one capture after another erupts onto the screen, revealing a bottomless pool of musical ideas that don’t shy away from artistic experiments (Air Brush) and invariably put a spotlight on war, Holocaust, military dictatorship, Greek-Turkish reconciliation and the Cold War. Like eruptions triggered by the clash between universe and humanity’s own destructiveness … The excerpts ejected by this cinematic volcano are sourced from many different parts of the world. In one, several decades after Zorbas, we find Theodorakis dancing the sirtaki with Anthony Quinn on Munich’s King’s Square. In another, he enthuses about Soviet Alpine chocolate, retrieved from a “great cabinet”. And when his hands aren’t busy conjuring up chocolate, they love to direct and compose. This man is a marvel. – film-rezensionen.de: „Dance Fight Love Die“ is definitely enthralling – not least of all because of the very different interpretations – but occasionally quite strange and, in its own way, mesmerising. – WELT: This is what everything, from left to right, leads to: People will never be the way Mikis Theodorakis, the Marxist methusaleh, shapes them as musical figures. Mikis, the man, extends his arms as if to fly or dance, and states: “I am free”. – kino.de: Asteris Kutulas has produced an idiosyncratic portrait of Mikis Theodorakis. The film consists of four- to six-minute clips that come together in a wild trip across four continents. Personal moments receive just as much space as the music of Mikis Theodorakis. This cinematic essay is portrait, historic document and road trip in one. – filmdienst.de: You have to let yourself succumb to this patchwork of visual clips and musical maxims. Then, the artistic synthesis of “Dance Fight Love Die” transcends its piecemeal approach and becomes enthralling. – indiekino.de: A life in transit, peppered with ever-new encounters. Kutulas lets us participate in this turbulent trip and immense abundance that makes and shapes Theodorakis as a fantastic musician and humorous human with a huge heart. – kino-zeit.de: “Dance Fight Love Die“ is a rush of impressions that invites us to delve (even) deeper into Theodorakis and his oeuvre. – motzkunst.de: Using poetic and occasionally disturbing visuals for their road movie “from the spirit of music“, Asteris and Ina Kutulas head for a tunnel with the famous Attic light at the end, opening up new cinematic realms. – TV TODAY: An unusual mix of collage, essay and portrait of an exceptional artist. – Telepolis: Kutulas shows an illustration of the Mauthausen concentration camp, given to him by Simon Wiesenthal, and uses Wiesenthal’s own words to remind us that the Nazis weren’t only reprehensible for their murders, but also because they trampled all over human dignity. In many ways, “Dance Fight Love Die“ is a political film that uses retrospectives to reference current global affairs. – koki-es.de: DANCE FIGHT LOVE DIE is neither a conventional music documentary nor a traditional biography featuring artist interviews, explanations or a tried-and-tested chronological structure … The film centres around the many – occasionally very personal – moments and scenes of Theodorakis during tours, (private) travels and productions. All recordings portray a highly focused, perfectionist composer in his element who feels music in every vein. – spielfilm.de: We’re on the road with the enthusiastic Greek composer – and this continent-hopping tour is often surprisingly funny … an audio-visual, associative journey that uses images and sounds from a 30-year collaboration to capture the man and artist Mikis Theodorakis. – Sächsische Zeitung: There are few words in “Dance Fight Love Die“. It is mostly about inspiration, eros and, naturally, one of the most formative composers of a century. – hardsensations.com: In “Dance Fight Love Die“ Asteris Kutulas documents the furious productivity of Mikis Theodorakis. He frames Eckermann-esque labours of love in passe-partouts and stages them like a slide show. For thirty years, Kutulas has been collecting private and public slivers of the Greek national hero who doesn’t mind the camera by this side. Theodorakis lives in an incessant creative frenzy. – Frankenpost: “Dance Fight Love Die“ – the soundtrack of a life … This also turns the film into a soundtrack of 20thcentury Greece and its dark chapters during which Theodorakis fought and suffered – from the Second World War to the civil war and up to the country’s military dictatorship. According to Kutulas, he managed to escape from a death chamber in 1944, but was buried alive during the subsequent civil war in1948 and had to suffer a mock execution by the ruling junta in 1967. For him, death is as much part of life as dancing, fighting and loving. – programmkino.de: … Theodorakis is an important symphonic composer; he is a director and choirmaster who delves deep into the respective work and remains skilled at conveying thought-provoking ideas – on love, on death, on fear. Unfettered by dramaturgical structure, this documentary captures his life in a wealth of images and short scenes: Theodorakis and his art graced Athens and Crete as well as the Himalayas and St. Petersburg, Jerusalem as well as the Bavarian town of Passau and San Francisco, South Africa as much as the Turkish cities of Ephesus or Cesme. Naturally, the film also shows his attitude and statements on political issues: on fighting his country’s former German occupation, on the Greek junta and military dictatorship, on their opposition, on the Mauthausen concentration camp (Symphonia Diabolica), on the murdered Anne Frank or the Nazi hunter Simon Wiesenthal. He loves ballet as much as symphonies, oratorios as much as opera, with its many arias and chorals featured in the film from Medea, Antigone, Elektra or the Mauthausen oratorio. Then, there are lyrics and poems; he talks about war and love; he dreams of the highly problematic Greek-Turkish friendship; he ponders how humanity hurts the Earth. Altogether, an impressive life and, altogether, an impressive film. – Zeitungsgruppe Mittelhessen: The film is a worthy homage to the musician, democrat and humanitarian, without putting him on a pedestal, which wouldn’t suit the musical anarchist anyway. Instead, it offers an associative cinematic collage in the style of Alexander Kluge. Across a range of short clips, young dancers and artists who underscore his work’s relevance to the present, demonstrate just how contemporary Theodorakis music remains, also giving musical room to well-known contemporaries like George Dalaras, Maria Farantouri or Zülfü Livaneli. Plus, naturally, many impressions of the seminal artist himself who remembers early moments stargazing with his father and the loving care of his Turkish mother, but also tongue-in-cheek ruminations about his own cosmos of air, earth, water and universe. – unsere zeit: During the ninety minutes of his latest, genre-busting film, “Dance Fight Love Die”, Kutulas meshes very personal moments and historic material, documentary footage and unsettling fiction – in specially produced, epic, feature-style scenes of lovers, pregnancy, in-fighting or demonstrative suicides … Focusing on Theodorakis, who regularly can’t stop himself from singing along while conducting, this travel film collage jumps between the times and locations. The contrasting clips and camera captures follow musical associations on an “echo wall”. – ZITTY: What a huge project: Film-maker Asteris Kutulas spent three decades trailing the famous musician, composer and writer Mikis Theodorakis with his camera. From the resulting 600 hours of footage he has now distilled this film. And delivered an extensive portrait of a restless soul. – evensi.de: The film “Dance Fight Love Die – With Mikis on the Road“ is neither traditional biopic nor concert film, but a visually stunning collage that conveys the art and personality of this important European composer and helps us understand how this passionate, exceptional artist could become the role model for an entire nation. – screeneye.gr: … an anarchically structured, but dynamic trip to different destinations where music has the first word in everything Asteris Kutulas and his wife Ina capture. The film features the voices of Mikis and countless young and old artists who cover his songs. In some instances, Kutulas references his own 2015 film, Recycling Medea. There is no logic: Anarchy rules the film’s structure, but this anarchic structure also accounts for this work’s inherent charm. Elias Malandris (author and theatre critic): … The enchanting female characters in Kutulas work feel like the protagonists of a painting, just like they do in his film “Recycling Medea”. Asteris Kutulas knows Mikis very well and lets us catch glimpses of some the artist’s more personal sides, of his cosmos, of situations with people who are close to him, of his thoughts and ideas – and of disturbing moments in short, very private captures. The film is a precious document of an entire life. – heilewelt blog: I have seen quite a few music documentaries in my life. But I’ve never seen one like DANCE FIGHT LOVE DIE about Mikis Theodorakis, a Greek composer. I haven’t known his music beforehand and it’s not a traditional documentary, I feel like I now know what drives Mikis… I found this a very refreshing way of showing a life’s work. Music is emotion and that’s is what the film transports… At some point you get used to the tempo of the film… I highly recommend this movie. You don’t even need to understand Greek or German. – BeNow TV: “A unique cinematic collage“: This is certainly no film to be expected. Nor a conventional artist portrait … The film doesn’t set out to explain. It is a somewhat enigmatic work – and there’s nothing wrong with that. It even needs to be. In its choice of images, music and montage, the film contains many signs and codes … Its perspective remains mysterious and multi-faceted. Time and again, it throws up new impressions with Theodorakis as the anchoring factor. The rest of the film blurs, fluctuates and keeps surprising us with unusual ideas … Because Kutulas‘ film is less tame-informative documentary and more essay-style exploration of the mythical person of Theodorakis resp. the mythical power of his music … it is a cinematic odyssey. – greeksnewagenda.gr: Filming Greece – “Dance Fight Love Die“: an idiosyncratic portrait of an idiosyncratic artist … Based on over 600 hours of filmed material starring Mikis Theodorakis in any possible situation, “Dance Fight Love Die“ by Asteris Kutulas is a hybrid film on the hybrid life of one of Greece’s most prolific figures, composer Mikis Theodorakis. For thirty years (between 1987 and 2017), Asteris Kutulas organized many major Theodorakis concerts around the world, while he accompanied and occasionally filmed Theodorakis on his travels. This resulted in accumulated film footage of Theodorakis’ travels around the world. Kutulas complemented this material with „fictional“ shootings (filmed by DOP Mike Geranios) adding a subplot inspired by Theodorakis‘ autobiography „The ways of the Archangel“. 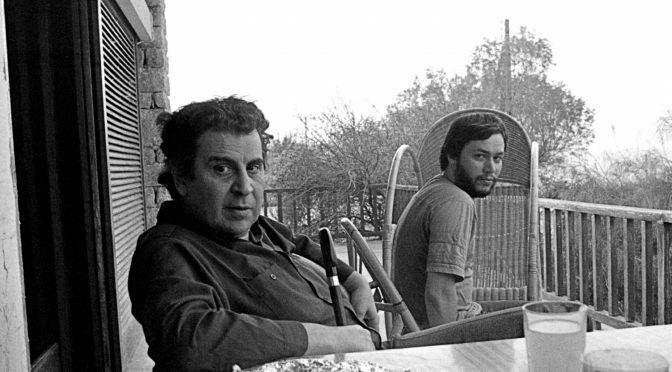 This docu-fiction film, an experimental portrait of the artist, offers an insight to lesser known aspects of Theodorakis‘ personality, while it cites the universal influence of his music. Hans-Eckardt Wenzel (songwriter & author): A very impressive film. The ornamental aspect doesn’t get out of hand and the documentary angle adds a sense of soft realism to everything. The film approached Theodorakis’ music in a very astute way while also unleashing its global nature, untethered to the language of words or country norms. The most impressive part was the visual sequence featuring the dancer and Mikis wearing a gas mask at the demonstration. You can feel this sense of justice, this gentle humanism that is sorely lacking in today’s world. The film shows a good way to approach the all-pervading power of music. I can only guess how much work this movie was. Excellent editing, great musical structuring, those breaks between sound and silence, between movement and rigor. I am truly impressed! This film entirely matches my own view and understanding that the only way to escape the current crisis cannot be political, but must be cultural. Asteris Kutulas already revealed to me an independent approach of a most personal point of view in his very first work: the film “Recycling Medea”. For me – looking at it from an artistic point of view – this was a fortunate coincidence. Through his perspective and approach, he introduced completely new ways of expressing and dealing with my own work and my personal life. At first it wasn’t easy for me to adjust to his special approach, because of the vast amounts of work I had already made, as well as the fact that I had been developing my own aesthetic and philosophical codes for a long time. But instead of Asteris’ unusual directorial interpretation of my work and life repulsing me, the opposite happened; they enriched me psychologically, spiritually and creatively because they inspired me to see myself and my work with the fearless eyes of today and tomorrow. I will say, this approach has made me feel young, because this view redeems both my work and me from dozens of years formerly burdened by my untamed life.